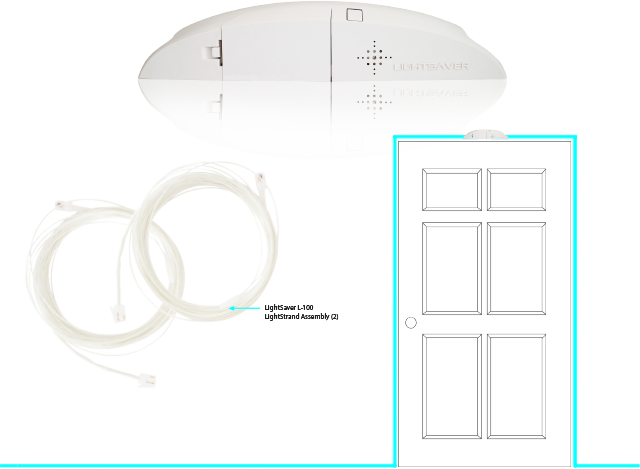 LightSaver’s LinearStrobe™ Home (L-100)’s patented technology is powered by a 9-volt battery and constantly searches the airwaves throughout your home or office and listens to detect the sound of a smoke detector or building alarms. When it recognizes these tonal patterns and frequencies, it is automatically triggered to immediately illuminate the entire periphery of the exit doorway (and baseboard areas on both sides of that door) or the periphery of windows with a brightly pulsating very distinct emergency light. By design, the LightSaver Light-Strand™ broadcasts its light in color and form which is among the easiest for the human brain to see and process. This easy-to-see light pulse defines the universally recognized shape of the doorway, is immediately recognized by all, and attracts the occupant without thought or hesitation to a predetermined safe exit (egress) point in a fire crisis. Model L-100 Single Station LinearStrobe™ are a UL 217 conforming accessory to Single and Multiple Station Smoke Alarms, the “Single-Station LinearStrobe™ is designed to “visually” alert individuals to the existence of a fire emergency and “visually” assist them in recognizing that alarmed audible smoke detector alarms in the space have been activated and broadcasting their emergency signals. When installed around an exit doorway, the single-station LinearStrobe also demarks the exit location and immediately adjacent flanking is useful in directing occupants to that exit. While just as useful for any sighted or partially sighted occupant of a house or building when fire and smoke strike, the S-LinearStrobe™ has a powerfully distinctive and critical utility to those whom cannot hear commonplace smoke detector’s alarms whose ordinarily aurally broadcasted alarm sounds are present but completely ineffective for the deaf and hard of hearing person in the most critical moments early in a fire. This affordable and easy-to-install technology can be particularly useful to the hearing impaired in private residential settings where visible notification appliances are virtually non-existent in the United States and are not required by codes and ordinances. These devices are self-contained, sound-activated, 9VDC battery-powered and are activated when nearby single-station smoke alarms (and often, other audible fire alarms) are activated. The device is also designed to be triggered/activated by many firefighter’s P.A.S.S. devices which may be operating within the listening radius of the S-LinearStrobe™. The S-LinearStrobe™’s are not interconnected with other notification appliances and do not synchronize their light emissions with other visual notification appliances in a space or a building; like their IntegratedLinearStrobe™ cousins which are designed for public accommodation, commercial and other ADA controlled settings. Generally, this version of theLinearStrobe™ technology’s onboard microprocessor samples the ambient background audio in its space approximately every 2 seconds; “listening” for the tonal patterns and frequency values of the audible signal generated by code compliant smoke alarms. When these patterns and frequencies are identified, the S-LinearStrobe™ device’s two standard-length 12′ long linear luminaries are automatically triggered to flash in a 2Hz flash pattern; highlighting the universally recognized shape of the doorway, an emergency egress window or alternative pre-planned path of egress where installed. Nearly 20 next generations of the S-LinearStrobe™e are already in development design stages and/or are proto-typed and in testing today. There is an entire line of products underway to change the way we alert, demark and direct evacuating occupants out of a structure when fire or other emergencies strike. So inconspicuous, you don’t even know it’s there … Until your life depends on it. Type: L-100 Modular/Wireless, Sound-Activated Emergency Exit Identifier. Luminary Type: Uses (2) LightSaver Light-Strands™ (Std. 12’ lengths). Power Source: Onboard Standard 9v Battery. Battery Size: One (1); Standard 9v included with the device. Warranty: One (1) Year Ltd. Manufacturer Warranty. CE Marked and pending UL985, UL1638 and UL 746C (enclosure material) listing marks and Lloyd’s Marine testing for marine/boating applications (ENV3-Enclosed spaces). Available in “waterproof” version (special order/price). Manufactured under strict Certified ISO 9001 Standards. Meets all applicable standards & requirements. Where there’s fire, there’s smoke. And where there’s smoke there’s darkness. In a fire, disorientation, panic, and confusion quickly set in. LightSaver gives you, your family and rescue personnel a guiding light to safety during fires or other emergency situations.